August equalled July as the hottest month in modern times, the UN's weather agency said Friday, warning that extraordinary temperatures were "set to become the new norm". The United Nations Meteorological Organisation (WMO) also forecast that 2016 will prove to be the warmest year on Earth over 137 years of record-keeping. "It is looking likely that 2016 will (be) the hottest year on record, surpassing the incredible temperatures witnessed in 2015," WMO chief Petteri Taalas said in a statement. The August figures were an especially jarring reminder of soaring temperatures on the planet, since July has typically proven to be the hottest month of each year. Citing data from the European Centre for Medium Range Weather Forecasting and the US space agency NASA, the UN said August "wound up tied" with July "for the warmest month ever recorded." 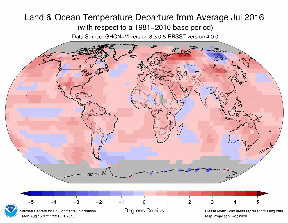 The average temperature last month was 0.16 degrees warmer than the previous hottest August, which was in 2014. Last month was also 0.98 degrees warmer than the average August temperature from 1950-1980, the WMO said. Scientists say the heating trend is being driven by fossil-fuel burning, and is made worse by the ocean warming phenomenon known as El Nino, which came to an end in July. "We have witnessed a prolonged period of extraordinary heat which is set to become the new norm," Taalas said.